Autumn Lake stopped cold in her tracks. She puffed a breath of summoning courage as she gazed at the old covered bridge before her. Ever since she was a child and Sawyer had read to her the fascinating yet thoroughly haunting story of The Legend of Sleepy Hollow by Mr. Washington Irving, Autumn had secreted a fear of bridges. Each time she was meant to cross a bridge (especially the old covered bridge on the far side of the orchards), she expected the ghostly headless horseman to appear and attempt to decapitate her. Oh, certainly the tale of the Specter did nothing to soothe her either, for it was said that this was to be a year of the Specter. As the story went, the local phantom, the Specter, only appeared once every ten years—but this was to be the year of the Specter, and Autumn did not like crossing bridges even when it was not a year of the Specter. Gulping down her fear, however, Autumn glanced behind her, assuring herself that there was no headless horseman riding up behind her intent on stealing her head. As Autumn stepped onto the bridge, the roof blocked the warm sunshine, making the space inside the bridge dark and gloomy. Yet she’d expected this. What else would one expect of a covered bridge? After all, its very purpose was protection from the elements, and that included the heat of the summer sun. Naturally, Autumn preferred to think of its purpose as being made for something else—the seclusion necessary for the romance of lovers’ trysts. She sighed with disenchantment for a moment—disappointment at never having had a lover of her own. She thought how different it would be to cross the old bridge if her arm were linked to that of a strong and handsome lover. Still, she had no lover, and the fact remained that she must indeed cross the bridge. 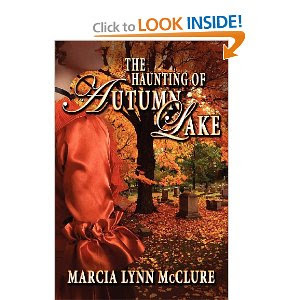 I purchased this paperback copy off amazon.com I Loved Ransom and Vaden's story (Visions of Ransom Lake) and was excited to see a story about Autumn. The story is cute and clean as Marcia is know for. I liked how selfless the hero is. I think Ms. McClure did a good job with her villian. This one is better than the last book I read of hers The Trove of the Passion Room. I felt that Ransom and Vaden's making out and banter was distracting from Autumn's story. I found it weird that Autumn has a obession with her parents kissing. I also think that Ms. McClure needs to find a new editor. She has been writing stories for over ten years (this is not a hobby) and when I pay an arm and a leg for one of your books (which I think are over priced). I want it to be free of errors. The errors distracted from the story.